I had to. And I’m not sorry, either. 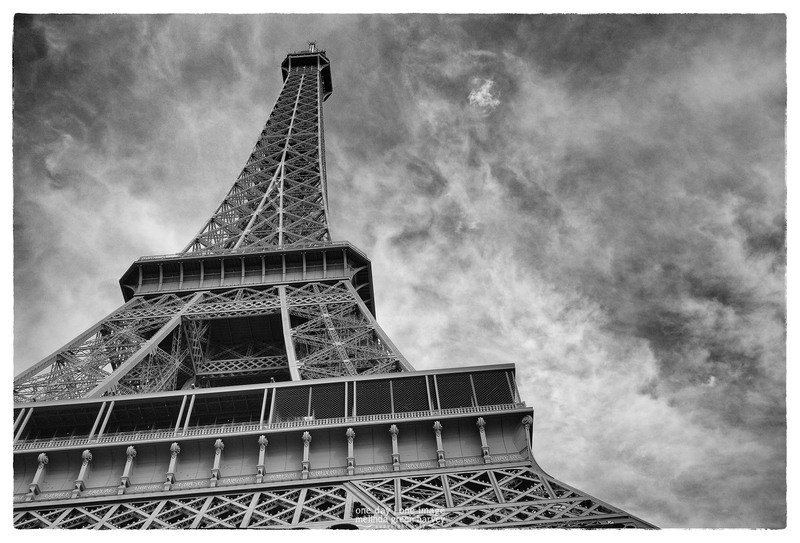 Posted on July 23, 2017, in Photography and tagged 365 photo project, architecture, black and white photography, Eiffel Tower, France, iconic building, learning to see, Leica, melinda green harvey, monochrome, one day one image, Paris, photo a day, photography, postaday, thoughtful seeing, tourist attraction. Bookmark the permalink. 10 Comments. Evidently Hannah is getting to take ” The Grand Tour ” . Lucky she be. Just because it may be a shot everybody takes isn’t a bad thing. If you can get a shot nobody else has done that is fine but limiting. Another one of “Their Rules” fun to break. Can someone help me off this soap box ? I’m not as spry as I used to be. We took Hannah on a two week trip, which isn’t quite a Grand Tour. But it WAS a grand tour. Photographed countless times. But this one is yours which is what makes it unique. Thanks – it’s hard to try to do something different in a place like this. Plus I was traveling with a group so I couldn’t just wander around taking pictures (which is what I usually do!). In situations like this, I try (if possible) to be not the one who follows but the one who leads. It can be very liberating. Most people are gregarious animals and prefer following. That is a very good plan, and I’ve used it myself. A lot. Hey, I like this composition and consider it unique! Thanks – I didn’t have very long at here, so I didn’t have the luxury of contemplating the best angles and etc. I had to take what I could get.